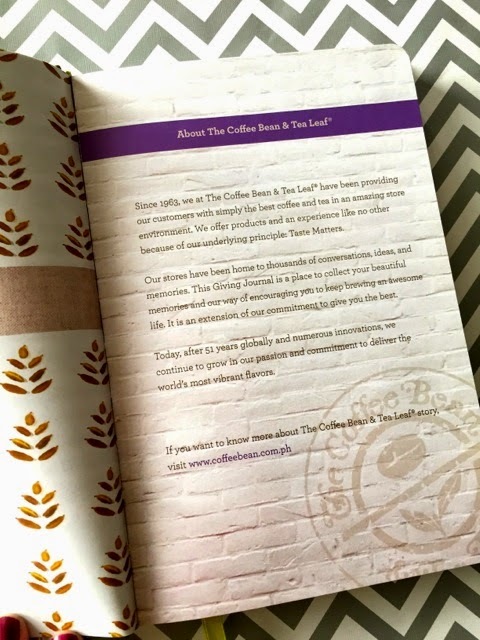 I already bought The Day Designer planner for 2015 but I really like the mission of Coffee Bean & Tea Leaf when it comes to their 2015 Giving Journal, so I wanted to help them promote it. 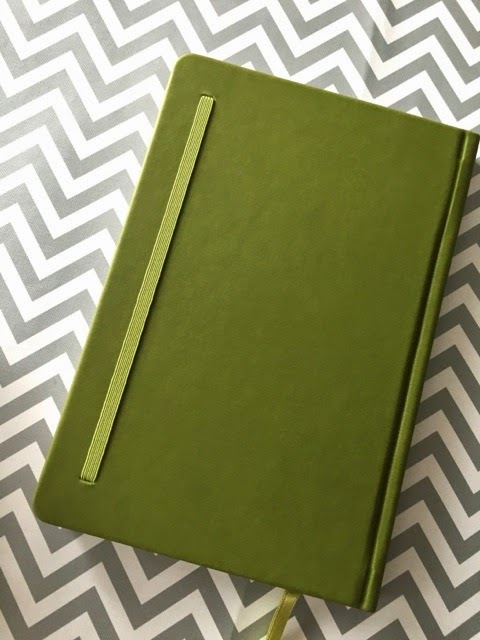 And it's a really nice planner, too! Let me tell you a bit about its story before I do my review and giveaway. The Lord is my shepherd; I shall not want. He makes me lie down in green pastures. He leads me beside still waters. He restores my soul. He leads me in paths of righteousness for his name's sake. Even though I walk through the valley of the shadow of death, I will fear no evil, for you are with me; your rod and your staff, they comfort me. You prepare a table before me in the presence of my enemies; you anoint my head with oil; my cup overflows. Surely goodness and mercy shall follow me all the days of my life, and I shall dwell in the house of the Lord forever. 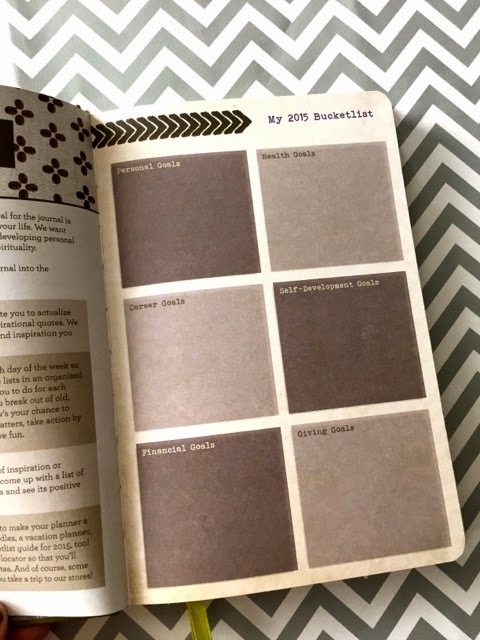 With the Giving Journal to help you plan your year, you can achieve goals and make dreams come true. When that happens and blessings abound, then your cup overflows and it is time to give back and share. It's really quite noble and true. Life takes on so much meaning and joy when you're sharing your life with others. A lot of us will say, "But I have nothing to give." We all have something! Time for our kids, talents for the community, hugs for our friends, smiles for the salespeople or maintenance staff, a sandwich to split with a co-worker, making a cup of coffee for your sleepy spouse. We always are blessed! We just need to see that God provides! 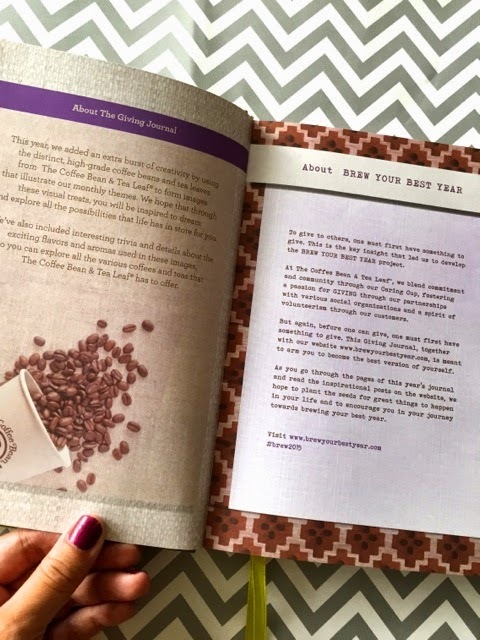 Every year, during the holidays, CBTL releases its Giving Journal, which benefits the Real LIFE Foundation. 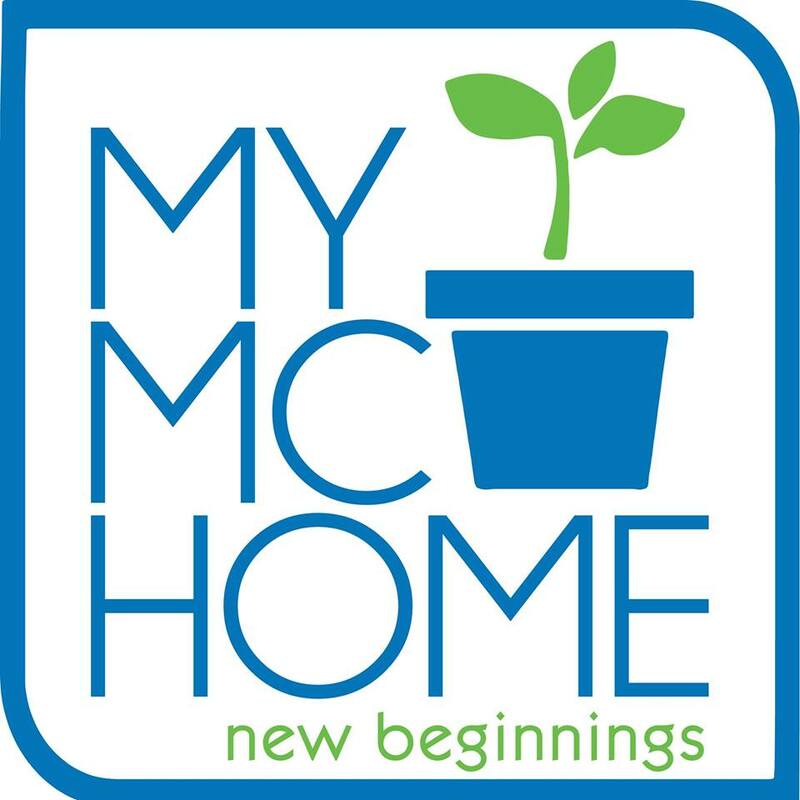 Since 2008, the company has raised more than P10 million and created awareness for Habitat for Humanity and Real LIFE Foundation. Poor but deserving scholars are given scholarships for high school and college. These scholars are also given LIFE coaching, where mentors help equip these kids with the values and skills they will need to succeed in the real world. I love love love the cover! It's hardbound in this smooth, velvety material. Nice to run your hands over it. I can imagine feeling pleasure every time I grab it to plan my day! It comes in other colors but I don't remember the others. Mine is a fabulous, soothing green. The names of the journal and the brand are embossed in front, and at the back is a garter seal. I like that the owner's info sheet is simple and easy to read. And large. Madaling hanapin at basahin. 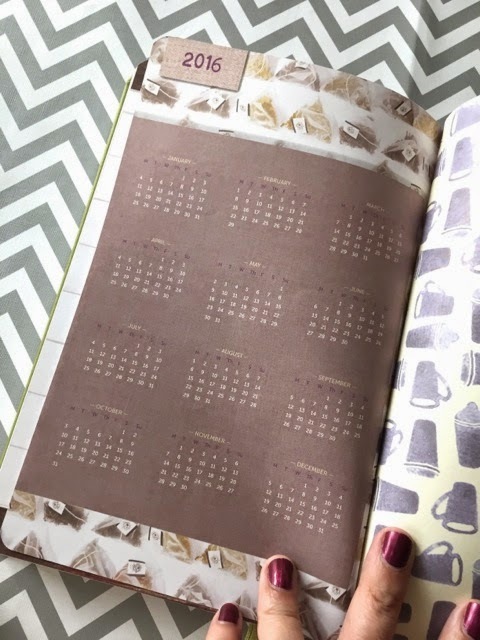 The whole planner, by the way, has lots of these bold and graphic patterns and designs. All earthy colors. I am not an earthy color person. I like bold colors like pink and orange and red and blue or just bold black and white. So this color scheme doesn't appeal to me. 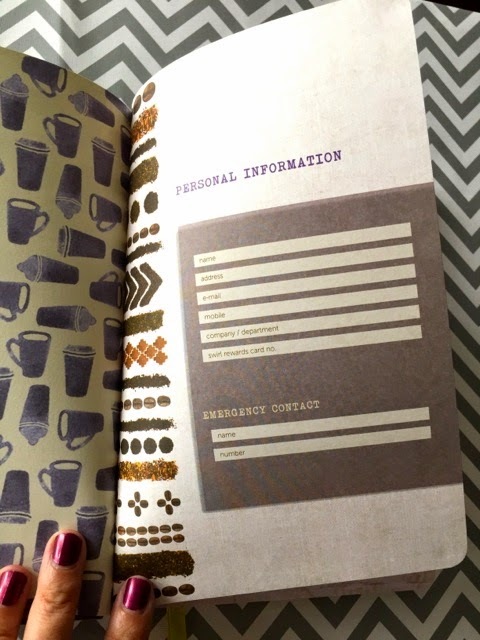 Then comes the pages of info about the brand. Can't be helped. 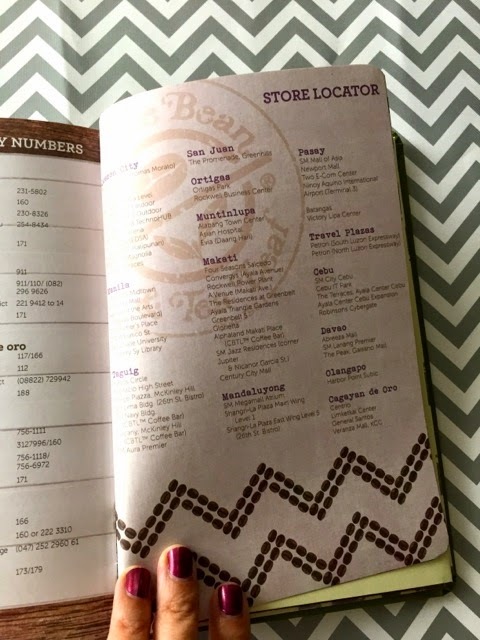 It is a product of Coffee Bean & Tea Leaf so might as well find out about the name behind the planner. 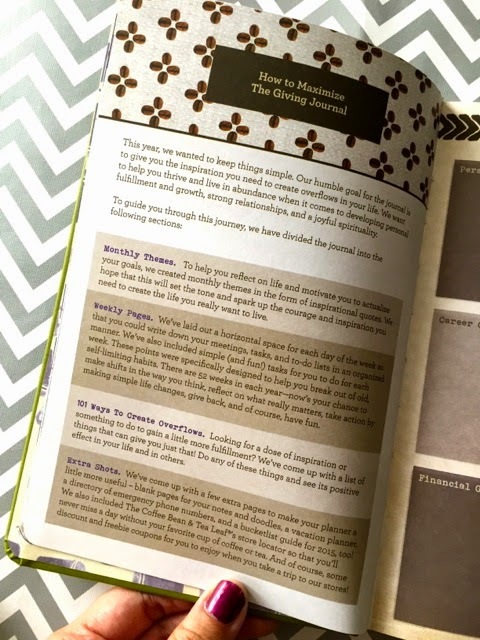 Then the information about The Giving Journal and how to use it for maximum results follows. 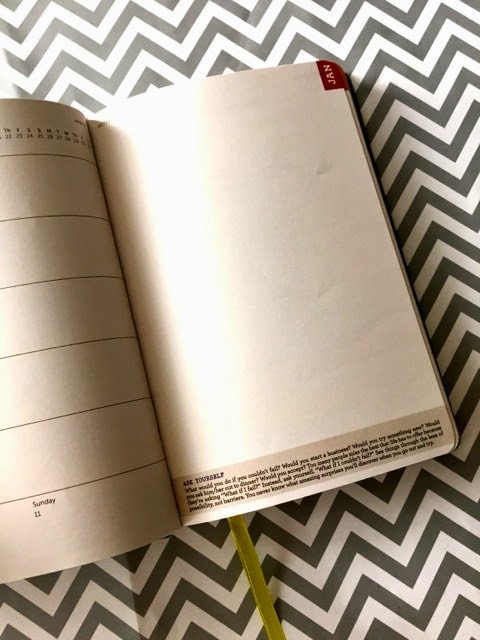 A page for your year's goals. I always like it when my plans are in one page in my planner. I am reminded every day of what my year's supposed to be like and I can then plan every decision and event purposefully. Only thing I don't like about this is three of the boxes are dark brown. Even if you use black ink to write your goals, mahirap basahin. 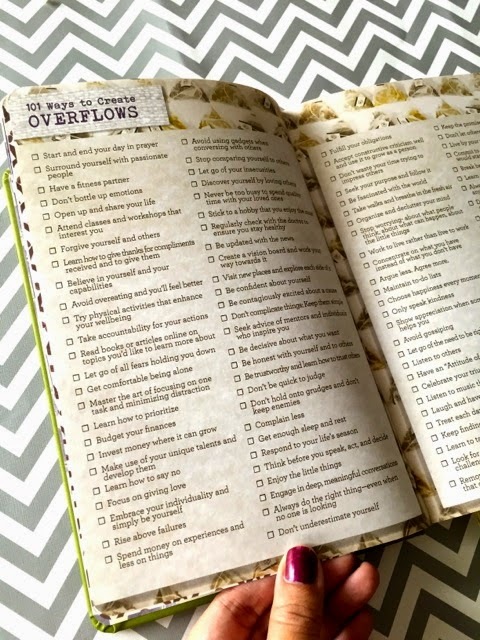 Two pages on how to create an abundant life. Very good and helpful suggestions. Some are so simple, which is a good reminder to us all that improving our life needs just small and simple steps. Vacation planner sheets for those getaways we all need. Coupons! Sobrang sulit the coupons! Daming free! So if you're a CBTL fan (like me! ), you'll be super happy with the offers and deals in The Giving Journal. 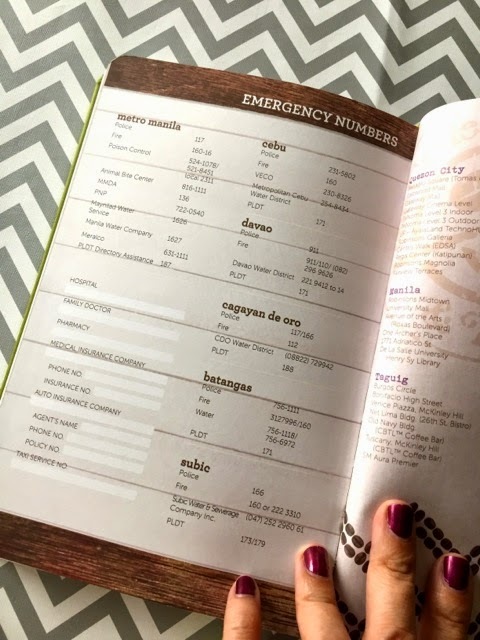 Okay, planner pages! They're very simple. Every month starts with a calendar. Love the simple layout. Thank goodness they didn't put those earthy colored graphics here. 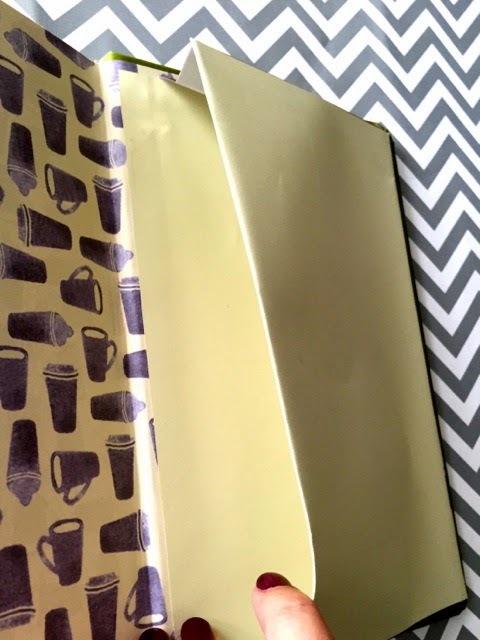 I don't want to be distracted from my schedule by patterns! 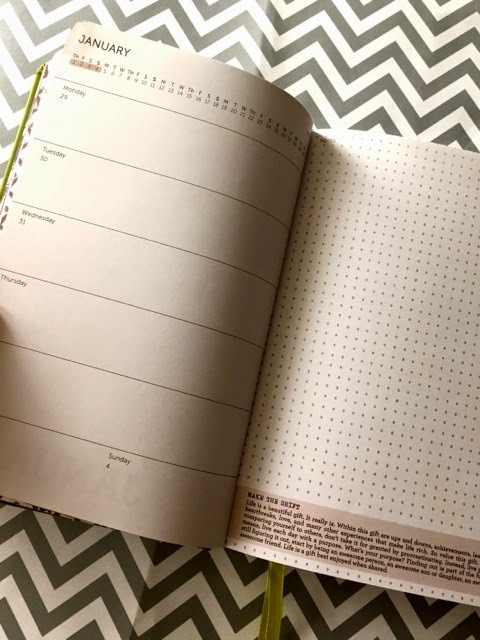 I truly love love love this weekly layout, where the week is on one side and the other side is for your To Do list. I've been using this kind of planner for years. 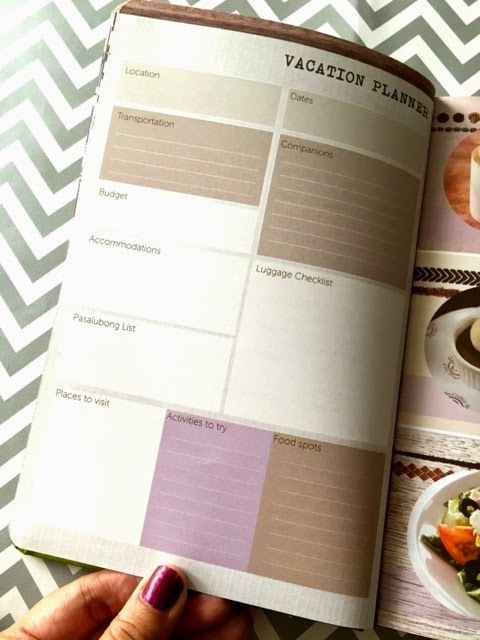 It's more flexible than a daily planner (which I'll be trying out for 2015) but more detailed than a monthly layout. There are two kinds of notes pages—a dotted one alternating with a blank one. Helpful advice and inspiration is found at the bottom of each notes page. After 52 weeks, you get a congratulatory note. Hey, everyone who survives life needs to be congratulated! Then blank pages follow, which I always find useful for ideas, notes, drawings and photos. The last few pages are for helpful information. The inside back cover has a pocket for receipts and other odds and ends. I think all planners should have a pocket! 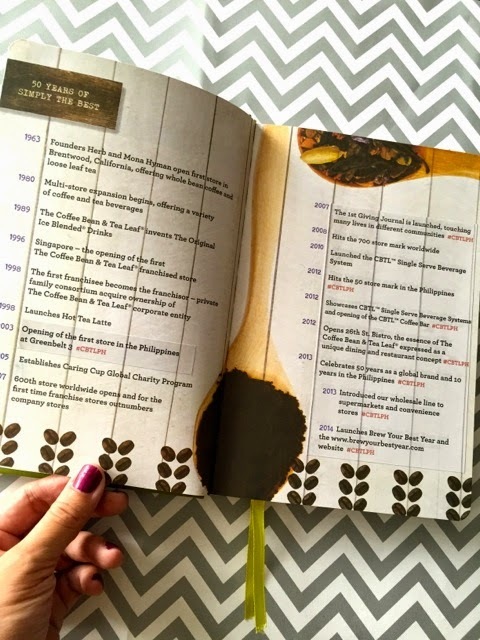 The planner pages. They're simple. Like I said, I want to be focused on my plans so I like that there's no distracting graphics. No extra unnecessary stuff like measurements, time zones, phases of the moon, etc. Well, it's a matter of taste but dark colors feel heavy. I don't want to feel heavy when I'm planning my day. 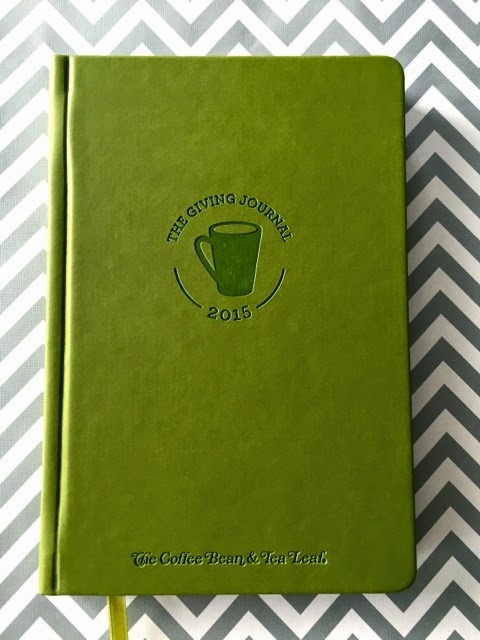 Sana The Giving Journal is available for outright purchase. You can get it for free by collecting stamps for every drink you buy, but what if you're not the patient type? Or you forgot/lost your stamp card? Stress!!! 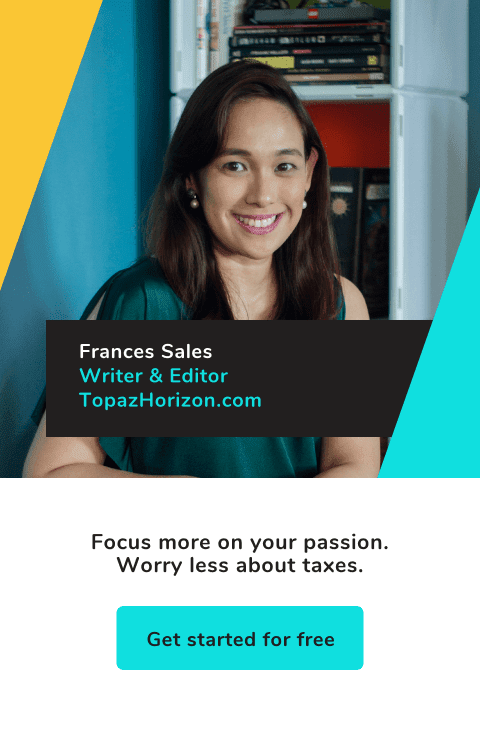 "What Topaz Horizon blog post inspired you to be a better, more giving you?" Leave your Facebook account name or Twitter handle so I know how to contact you in case you win. Yes, that's all! Oh, and you need to have a Philippine address. Giveaway ends exactly 24 hours from now. So that's January 1, 4:30pm. Happy New Year and good luck! *This planner was given to me. This is not a sponsored giveaway. I'm just giving it away because I already bought a planner! 1. 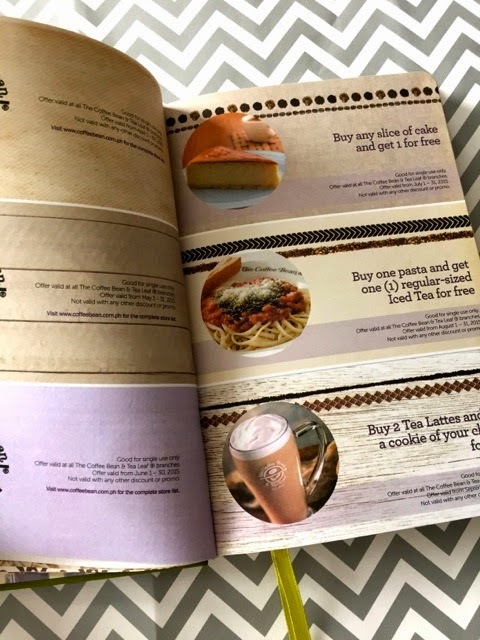 A minimum single-receipt purchase of a regular or large sized Original Ice Blended®, Espresso/Coffee-based, or Tea-based Beverage, Frozen Swirl or CBTL™ capsules qualifies a customer to get a stamp card. 3. Stamp card must always be presented UPON PURCHASE so that a circle may be stamped whenever its corresponding product assignment is purchased. 4. 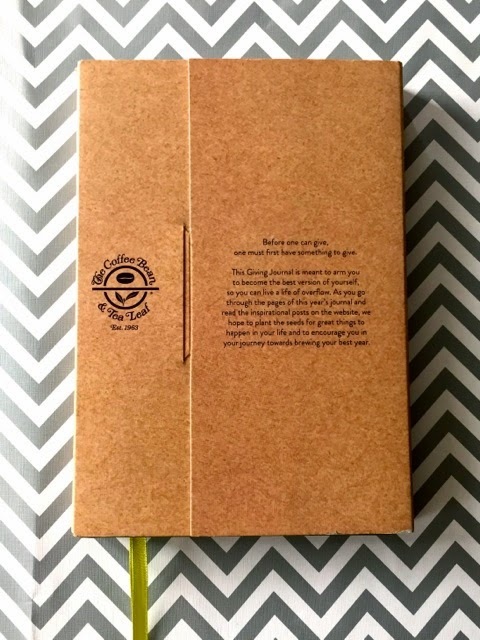 Once all 12 circles are stamped and completed IN ONE STAMP CARD, customer will be able to claim The Coffee Bean & Tea Leaf® 2015 Giving Journal at any The Coffee Bean & Tea Leaf® branch. Combining of stamps cards is not allowed. 5. The completed stamp card should be presented and surrendered to the branch where The Giving Journal will be claimed. 6. Not valid in conjunction with other promos. 7. Promo period is from October 25, 2014 to January 11, 2015. 8. Giving Journals may be claimed beginning October 25, 2014 until 60 days after the promo has ended. blissmakerie, gather up bloggers who really inspires people and make them feel special . Not by makeup, fashionable clothings or high tech gadgets. Just be simple and do good. To answer your qestion, the Topaz Horizon Gift Guide post helped me be more giving. It sure set a high standard on me giving gifts to others. I specifically followed the over the top point. :) was really able to apply your tips over the years. 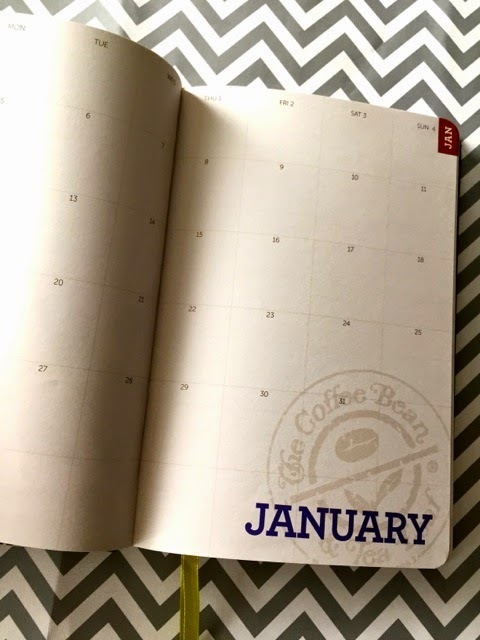 Id really love to win the cbtl planner. I am not sure if I will be disqualified but my answer is a Topaz Mommy blog entry. I vividly remember an old and short blog post of yours titled: "If the world were to end today." That post reminded me of how short our lives really here on earth really is and that we should treasure everyday as if it were our last. Made me realize I have to really do my best to make a difference in the lives of the people that I can touch. Hanggang ngayon hindi ko pa nalilimutan yung post na yun. :) Anyway my Facebook name is Love del Rosario (loveptrp@yahoo.com). I have a twitter account but I rarely check it hence Facebook nalang. Cheers to a happier and healthier 2015 Frances! :) I hope I win this. 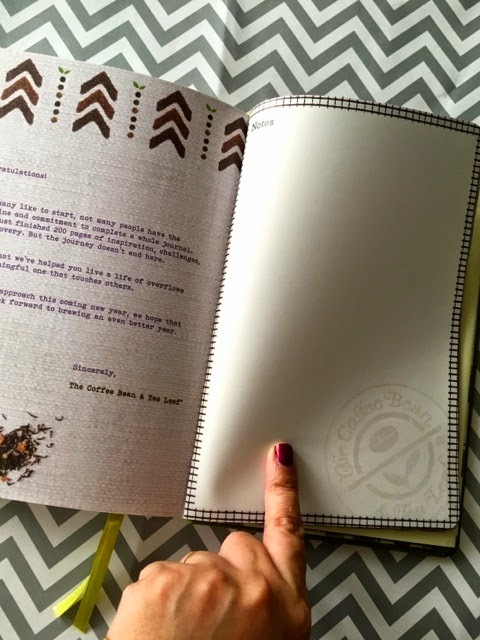 I already have a Starbucks journal but I will give that one away if I win this one haha! Your post made me want to own this journal but too late na for me collect stickers. The Topaz Horizon blog post inspired me to be a better, more giving you is Katie Holmes says, "Be your best beautiful." Here are 5 ways to do it. this post makes me realize that every changes or chances to be a better or best person should always start within you! its about feeling beautiful even when you're down and making the best out of it! having a happy prospective! i also love reading your post on how you take care of your kids ,it inspired me to be patient and have a happy bonding with my kids! the question is very hard :D I usually read your blog and I love every post you posted :D your blog posts defines that you are a very awesome person that is why I always read your blog to know you more.. You Inspires me a lot :) lalo na sa pagiging mom, even if I am not yet a mom haha! This article http://www.topazhorizon.com/2014/06/looking-back-in-gratitude.html inspired me to be a better person. Like you, I was at crossroads choosing between being a hands-on mom to my sickly daughter and holding on to a job I wasn't too happy about but one that definitely help settle monthly bills. I was glad I made the right choice of looking after my child and rely on God's promise of looking after our needs. Life after my work was hard as money was hard to come by but we still manage anyhow. Most importantly, my life is less stressful and all in the family are happy now that we have much time together. This blog post http://www.topazhorizon.com/2014/12/blissmakerie-prettiest-and-most.html has inspired me to be a more giving and better me. The post has sparked a desire in me to gather all my friends who have helped me this past year and to celebrate the gift of friendship through a simple but fun and well thought out party. "How do I teach gratitude?" This post transformed my outlook in life, on how to discipline a child and truly to live by example. Indeed, motherhood is a never ending role. I love your post about "how can i love another baby when i love my only son so much", i super can relate with the reader and the situation because I am an only child, and now have an only son. Before I was so hesitant into having more kids because I am not sure if I can love them equally, I am also afraid of favoritism. But after reading that post, and stalking you and your mommy blog about mothering your three adorable VIPs, you became my inspiration that true, a mother is a source of immeasurable love for her children. And if you are able to do it and balance everything (you can make motherhood looks so blissful), I can also do it. That post inspired me to give more of myself and more love to my growing family. Diba the more love you give, the more it will bounce back into you. I would like to say I'm inspired by your giveaway posts :). Whenever I get great things from giveaways, as much as I can, I also share it with my friends and relatives specially to my mom. Sometimes up to the point that they get the whole thing and nothing is left for me hahaha (Nahingi na nila) :O. But thanks for reminding me about Giving. That although sometimes I feel like I've got nothing else to give, I still have time, love, and care to share to others specially to those important people in my life. :) I'd definitely love to give more this year 2015 to my friends, relatives, students, and teachers. :) Happy New Year! I like the Topaz Mommy tab, anything about being a Mom to kids blog post interest me alot. managing time being a working Mom too. Hi Frances, Vince and the VIPs! Happy new year! Of all your posts, I find the Left Behind post the most giving one. Whenever I think about the rapture and how God gave Jesus to mankind as His greatest gift, it always puts me back on track. His gift of salvation is such a great gesture of giving. And through His gift, it allows me to be a better and more giving person everyday. Challenging but it cannot be compared to what God gave me. Topaz Mommy: My delightfully selfish reasons for breastfeeding inspired me a lot especially now that I am also a breastfeeding and first time mom. I have learned a lot from your blog and it gave me new ideas and tips to become a better mom to my son. Pambatang Solmux is giving away Christmas gifts! Make your kid's imagination real! Who wants a pair of Skechers GOwalk shoes? Cheez Whiz Milky Delight for baon or breakfast!